209 ; Elegant black original 1930s 3-piece outfit; dress and jacket with fur collar (probably rabbit), in thin devore velvet, separate slip in silk and chiffon. Slip B 97cm, A-line. Meant to be worn loose. Photo below with jacket. $220. 406 B 89 W 71 Length 131cm. 1940s or 50s. Unlined lace, will need a slip. Palest blue. Photo below over crinoline. 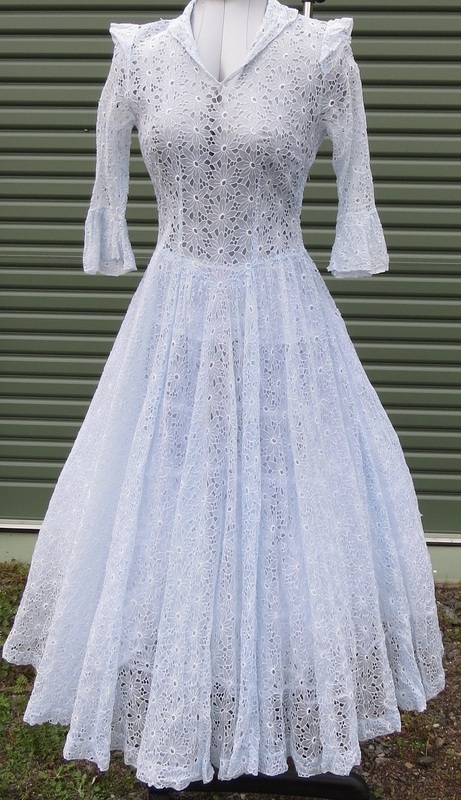 $70 (without crinoline). 407 B 89, natural waist 74 can be tightened by sashes at back. Length 108cm. Nylon-type fabric with shiny polka dots. 1940s, lovely "wartime sweetheart" dress. Colour lighter than shown. $80. 409 B 90cm, W 82, hip 98. Length underarm to waist 21, waist to hem 88cm. Probably made in the 1960s in 1940s Vamp style. Slinky material, bias-cut. Asymmetrical, with rhinestones on part of the bodice and waist ties. $40.